Rescue 21 – What Is It? Reduction of coverage gaps along the coast. Enhanced playback capability improving clarity of calls. Increased (and simultaneous) channel monitoring capacity, ensuring all calls get through. Rescue 21 is “standing the watch,” providing coverage of 34,912 miles of U.S. coastline. Rescue 21 – How Does It Work? You send your distress/May-day call. It is automatically recorded and digitized by the station receiving it. Direction finding (DF) equipment from one or more high sites computes the direction from which the signal originated, or line of bearing (LOB). Recall reading about 400’ radio towers being installed at USCG stations in the area? This is why. Your distress audio and the LOB are sent to the closest Ground Center(s). Appropriate resources (planes, helicopters, boats) are dispatched to respond immediately — even across regional boundaries. No turf wars in our surf. You’re in danger. We’re coming. You might say, “Well, direction finding technology has been around for decades. What’s the big deal?” While true and I’ve used it, this new digital technology is accurate to within +/- 2 degrees. Like a trusty pointer, USCG resources will fly down that Line Of Bearing – and find you. Who knows, with Rescue 21 in place, what the future holds – but greater safety of life at sea is part of it. Editor's Note: Rescue 21 was in the news just a few weeks ago in an article which credited the system for helping to save the lives of four recreational boaters in California. JACKSONVILLE -- A Holly Ridge man has agreed to pay nearly a quarter of a million dollars in restitution for false distress calls he made to the Coast Guard. Jeremy C. Fisher, 25, pleaded guilty in federal court to conspiring to make false distress messages. 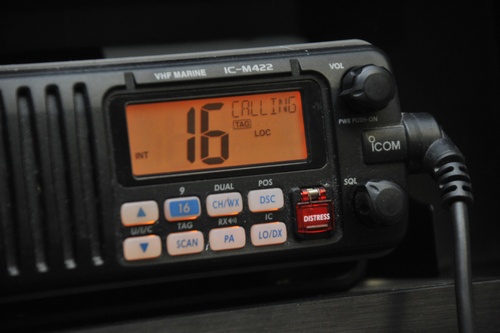 As part of his plea agreement, Fisher agreed to pay $234,111 restitution to the Coast Guard for all search and rescue costs associated with the hoax calls. William H. Yates, 22, of Sneads Ferry and Steven G. Medina, 21, of Onslow County, each pleaded guilty to one count of aiding and abetting false distress messages. Medina agreed to pay $233.48, and Yates agreed to pay $506.80 in restitution, according to a press release from U.S. Attorney George E.B. Holding. Fisher faces up to five years in prison followed by up to three years of supervised release. Yates and Medina each face up to six years in prison followed by up to two years' supervised release. what channel with NO DSC.